Baby Indian eggplants are chopped up and cooked in oil along with spices and onion. Cracked wheat is briefly fried along with fried eggplant and cooked in enough water till soft and fluffy. 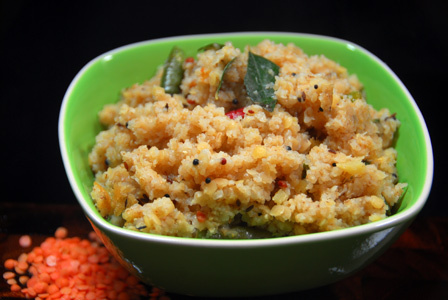 Serve cracked wheat eggplant upma immediately. 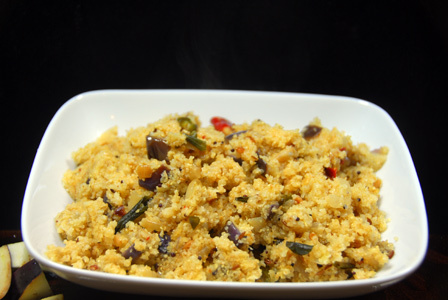 Makes: around 4 Servings of Cracked Wheat Eggplant Upma. Remove stems, wash and chop eggplants into small pieces. Remove stems, wash and chop the green chiles. Peel and mince the ginger. Bring to boil 3 cups of water in a sauce pot and keep aside. When mustard seeds start spluttering, add minced ginger, onion, green chiles, eggplant and salt. Fry for few minutes until eggplant turns little soft, stir in cracked wheat. Fry briefly and pour the boiled water and mix well. Cover and simmer for 2 – 3 minutes and remove from heat. Leave it covered for around 5 minutes before stirring and adjust salt if necessary. Squeeze quarter of a lemon and serve cracked wheat eggplant upma immediately. Notes: Make sure not to overcook the eggplant. Suggestions: Adjust spice with green chiles. Variations: Check other recipes with cracked wheat here. Other Names: Cracked Wheat Eggplant Upma, Vankaya Godhuma Ravva Upma. Erra Godhuma Nooka Palakura Upma. Moong dal is soaked till soft and added to spinach and spices. Cracked wheat is cooked along with spinach and moong dal. 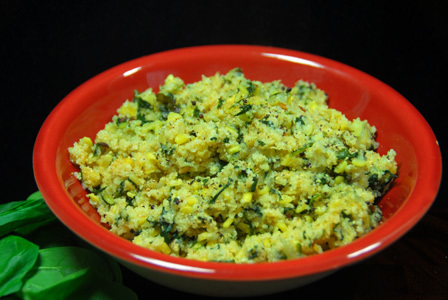 Once cooked, cracked wheat spinach upma is seasoned with black pepper powder and serve immediately. Makes: around 3 Servings of Cracked Wheat Spinach Upma. Soak moong dal in water for around half hour and strain the moong dal. When mustard seeds start spluttering, add minced ginger, onion and green chiles. Fry for couple of seconds, stir in spinach. Once spinach wilts, stir in moong dal, 3 cups of water and salt. Once water comes to a bubble, lower the heat, stir in cracked wheat. Cook covered on low flame for around 5 – 10 minutes or until cracked wheat absorbs all the water and is cooked. Sprinkle black pepper powder and serve cracked wheat spinach upma as a breakfast. Notes: Make sure cracked wheat is cooked well. Suggestions: Use fine cracked wheat when possible. Variations: You can also add a splash of lemon juice at end if you desire. Check other recipes with cracked wheat here. Other Names: Cracked Wheat Spinach Upma, Erra Godhuma Nooka Palakura Upma. Whole spices are fried in oil. Masoor dal is added to the spices along with water. Cracked wheat / broken wheat is cooked in spices along with masoor dal till cooked. Serve cracked wheat masoor upma with plain yogurt or with pickle of your choice. Makes: around 4 Servings of Cracked Wheat Masoor Upma. Peel, wash and mince the ginger. When mustard seeds start spluttering, add green chiles and ginger. Fry for couple of seconds, add masoor dal. Pour 2 1/4 cups of water and add salt. Bring to a bubble and let the water boil till masoor dal almost turns translucent. Stir in cracked wheat and cover with a lid. Cook on medium low flame for around 5 – 8 minutes or until cracked wheat is cooked along with masoor dal. Serve cracked wheat masoor upma with plain yogurt or with pickle of your choice. Notes: Make sure not to overcook masoor dal. Suggestions: If dal or wheat is not cooked well, add a splash of water if necessary and cook covered on low flame till done. Variations: You can also add your choice of vegetables like potato, green peas, carrot etc along with masoor dal. Other Names: Cracked Wheat Masoor Upma. Cracked Wheat Fenugreek Leaves Upma. Mixed vegetables are finely chopped and fried in oil along with spices and fresh fenugreek leaves. Cracked wheat is cooked along with fried vegetables till done. 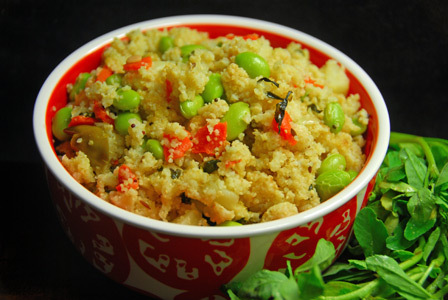 Serve cracked wheat fenugreek leaves upma. Makes: around 4 Servings of Cracked Wheat Fenugreek Leaves Upma. Separate fenugreek leaves and thoroughly wash them. Wash fresh soy beans and keep aside. Peel and chop the potato into small pieces. Peel, wash, remove ends and chop the carrot into small pieces. Fry briefly, stir in chopped onion, carrot,, potato, soy beans and fenugreek leaves. Fry for a minute or two, add 4 cups of water and sufficient salt. Bring water to boil, stir in cracked wheat. Cook covered on low flame for around 10 minutes or until all the water has been absorbed and the cracked wheat is cooked. Uncover, fluff the upma with a fork and stir in lemon juice and remove from heat. Serve cracked wheat fenugreek leaves upma. Suggestions: If cracked wheat is not cooked well, stir in few tablespoons of water and cook covered on low flame till done. Variations: Check other recipes with wheat here. Other Names: Cracked Wheat Fenugreek Leaves Upma. Cracked wheat is boiled along with milk till soft and cooked. The cooked cracked wheat is then flavored with cardamom powder and freshly extracted mango pulp. 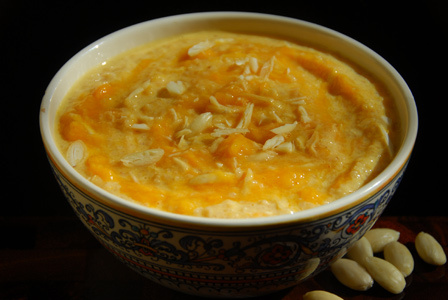 Serve cracked wheat mango kheer garnished with blanched and sliced almonds. Makes: around 2 Cups of Cracked Wheat Mango Kheer. Soak almonds in warm water for couple of minutes. Alternatively, microwave almonds in few tablespoons of water for few seconds. Peel the skin and slice the almonds. Wash the ripe mango and extract all the juice (around 1 Cup). Crush any big pieces of mango (if any) and keep aside. Heat milk in a sauce pot on medium low heat. Stir in cracked wheat and boil till wheat becomes soft and cooked. Add little water if necessary while cooking the cracked wheat. Remove the sauce pot from heat, stir in cardamom powder and jaggery. Let the milk cool to room temperature. Stir in mango pulp and sliced almonds. Garnish with few tablespoons of fresh mango pulp and sliced almonds. Serve cracked wheat mango kheer. Notes: Make sure cracked wheat is cooked well before removing from heat. Suggestions: Adjust jaggery according to sweetness of the ripe mango. Avoid jaggery if using sweetened mango pulp (ie canned mango pulp). Variations: Check other recipes here. Other Names: Cracked Wheat Mango Kheer, Godhuma Ravva Mamidipandu Payasam.